Welcome to Bloomsburg University. 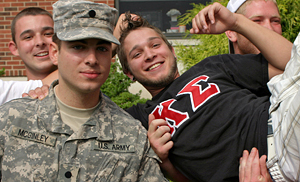 It is our goal to ensure your transition from military service to academic environment goes as smooth as possible. We have consolidated a list of the most commonly encountered issues regarding incoming students. The following are frequently asked questions that may serve as a resource to you. This list is not exhaustive. Air Force, Navy, Army, Marine Corps, Cost Guard personnel on active duty can use GI Bill® benefits, as can service members who are training overseas. Veterans with at least 90 days of active service after Sept. 11, 2001, are eligible for the new GI Bill®. National Guard and Reserve members with three years of active duty service after Sept. 11, 2001 also qualify for GI Bill® benefits. Before you can apply for the GI Bill®, you’ll need to gather some documents. Make sure you have a copy of your discharge papers DD form 214, which gives your information on Certificate of Release or Discharge from Active Duty. You’ll also need DD form 2384 or NOBE (Notice of Basic Eligibility) if you are applying for the MGIB and documentation if you have made contributions to any buy-in programs such as the Kicker (which you pay more money into the Montgomery GI Bill®). DD214 Form — This is the most important document of your military career. It details any military active duty service and/or awards received. You will need to provide this document to receive Purple Heart benefits if you will be applying for Vocational Rehabilitation. Dependents — If you have never used VA education benefits at any institution of higher education, you must complete the appropriate application form. If the student is a spouse or dependent of an active duty service member or military veteran then they must transfer their benefits to the student through the Department of Defense (DOD). Complete the Free Application for Federal Student Aid (FAFSA), using Bloomsburg University school code (003315). New students entering in the fall term should file the FAFSA by March 1. NOTE: Any aid received via FAFSA is not the same as aid received through the GI Bill®. Submit a copy of your Certification of Eligibility letter to your certifying official (listed below). After you have started classes, notify your certifying official if there's a change in the total number of credit hours for which you're registered because this affects your certification. Once you’ve started classes you must notify your certifying official. if there’s a change in the total number of credit hours because this effects the amount of aid you receive. Your benefits must be certified at the start of each academic year, so be sure to contact Bloomsburg Universities certifying official. Once you’ve chosen a GI Bill® program, you can compare your GI Bill® benefits to find out whether the Post-9/11 GI Bill® or the Montgomery GI Bill® offers you the best deal. The programs differ in tuition benefits and other details, so be sure to do your homework. Post 9/11 Veterans Educational Assistance Act (Chapter 33): The Post 9/11 Veterans Educational Assistance Act signed into law on June 30, 2008, took effect on Aug. 1, 2009. The new chapter provides up to 36 months of educational benefits for qualifying veterans up to 15 years following discharge or release from the last period of active duty. Montgomery GI Bill® Active Duty (Chapter 30): The MGIB program provides up to 36 months of education benefits. This benefit may be used for degree and certificate programs, flight training, apprenticeship/on-the-job training and correspondence courses. Remedial, deficiency, and refresher courses may be approved. Your benefits are payable for 10 years following your release from active duty. Vocational Rehabilitation (Chapter 31): The Vocational Rehabilitation and Employment (VR&E) Program is authorized by Congress under Title 38, Code of Federal Regulations, Chapter 31. The mission of VR&E is to help veterans with service-connected disabilities to prepare for, find, and keep suitable jobs. Also, Vocational Rehabilitation and Employment Service provides vocational-educational counseling to veterans and certain dependents. VR&E can provide a wide range of vocational and educational counseling services to service members still on active duty, as well as veterans and dependents who are eligible for one of VA’s educational benefit programs. Bloomsburg Universities veterans affairs Chapter 31 contact: Matthew Dragwa, Department of Veterans Affairs, 1123 East End Blvd. Wilkes-Barre, PA 18702, 570-821-2501. The VR&E will approve your eligibility and forward the necessary paperwork to the Veterans Affairs Desk at Bloomsburg University. Survivor’s and Dependents’ Educational Assistance (Chapter 35): Dependent’s Educational Assistance provides education and training opportunities to eligible dependents of certain veterans. The program offers up to 45 months of education benefits. These benefits may be used for degree and certificate programs, apprenticeship and on-the-job training. The VA will send you a certificate of eligibility once your application is processed. If you are certain about which benefits you are eligible for, you can enroll before receiving this form. Under the new GI Bill®, your school will submit a claim directly to the VA for tuition and fees. How do your benefits work? — All you have to do is bring in your statement of eligibility to the Bloomsburg University’s Registrar's Office, located in the Student Services Center building. Just fill out the packet that they have there. Be prepared to fill out additional required documentation, depending on your situation. range of activities designed to support and enhance the performance of students with disabilities. The office also serves as an advocate for the student in issues of accommodation beyond the classroom and acts as a liaison with other campus offices. The need for a specific accommodation must be clearly established within the documentation provided by the student. Documentation Criteria — Remember, the responsibility for demonstrating need for accommodation falls on the student. To demonstrate that need, students must supply appropriate documentation.